We slept not far from the most famous Norwegian fjord – GEIRANGEFJORD. In the morning there was always quite a lot to do. Repacking, washing, making food, eating and cleaning. Obviously, it took a certain amount of time. Til the moment we were ready to go, Tomek was usually ready to sleep. And normally, it made us happy because we could drive more kilometers. But not that day. We reached Geirangerfjord and couldn’t turn off the engine unless we wanted to wake him up. So we took turns in admiring the fjord. And it is worthy of its famous, I must admit.  I presume, that the ferry Geiranger – Hellesylt is also worth a trip. 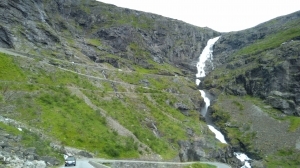 We saw only part of the fjord but it was magnificent with numerous waterfalls on steep slopes of the mountains. We drove from the south, leaving Hellesylt on the right side. Our ferry was considerably less striking than Hellesylt – Geiranger. It went from Stranda to Liabygda from where only 50 km away lies the next attraction of the day – TROLLSTIGEN. 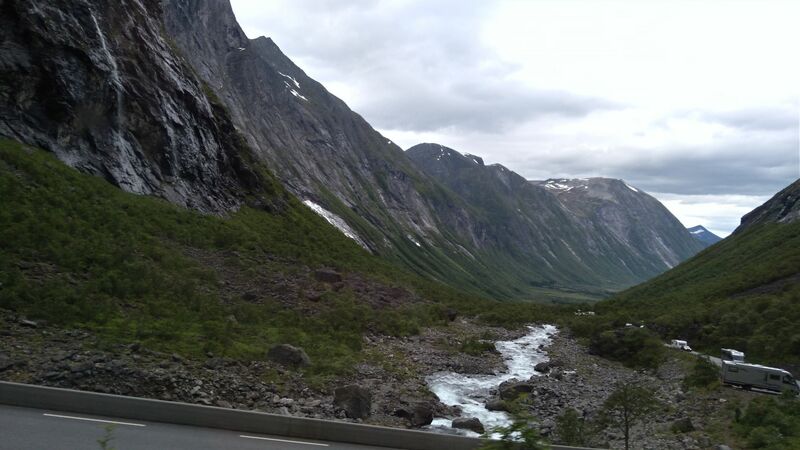 We were driving through beautiful mountain area with boulders scattered here and there, with water falling from tops and with the snow piling all year round. We arrived at the Visitor Center. We looked into souvenir shop but found nothing particularly interesting (except reasonable prices, again) and hurried on viewing platforms. In front of our eyes was Trolls’ Path in all its glory. It was opened in 1936 after 8 years of constructions. It consists of 11 hairpin bends. The average steep incline is 9%. It is usually closed from November until May due to weather conditions. At the highest point, it rises to 853m. It was Jurek who drove past this terrific road. Tomek was slowly falling asleep and I was looking through each and every window, just to see as much as I could. The road was widened at several points to make overtaking easier, although with too many cars it still was a bit complicated. Especially bends were tricky when a tour bus or a big trailer appeared in front of you. Quite dramatic and demanding drive. Recommended! How to drive through this? The day full of attractions. Just several kilometers more and there was another one – TROLLVEGGEN. The one, not the best marked but still possible to find. Especially that there is a Visitor Center built on the parking underneath. Troll Wall is the tallest vertical rock face in Europe – 1800m above sea level. Such a rock is an excellent place for climbers and parachute jumpers so-called BASE jumping. Also, part of Harry Potter was filmed here. The timing was perfect. We were under the impressive wall and were just about to make dinner. Few hours in such scenery is pure pleasure. After another ferry Åfarnes – Sølsnes we stopped at the parking right before the bridge to the island of Bolsøya. It was a really good place for a night. The bridge looked amazing in the sunset. And after surrounding a small rocky hill there was a beautiful view of the fjord and the land in the distance.